Chelsea lost 2-1 on the night as they went out of the Champions League to a highly talented PSG side. Eden Hazard, Pedro and Willian all started behind Diego Costa whilst PSG missed out on Marco Verratti. Aside from an early sniff for Diego Costa, the first twenty minutes of the game were a barrage of PSG attacks. The French side were dominant throughout the earlier segment of the game and there was a feeling of inevitability about Adrien Rabiot’s goal, when he poked in a beautifully played ball from Ibrahimovic. 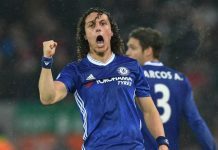 The French champions had been all over Chelsea, as Angel Di Maria ran riot and niggly fouls distracted from any attacking intent the Blues might’ve had. Gary Cahill was largely at fault for the PSG goal, as he left himself in no-man’s-land and allowed one of the best centre forward’s on the planet some freedom in Chelsea’s box. After Paris’ goal, the Blues got a foothold in the game and created several chances in the remainder of the half. Diego Costa was a thorn in the sides of David Luiz and Thiago Silva, whilst Thiago Motta picked up a booking that limited his defensive input for the rest of the game. Unfortunately, the industry of Matuidi and Rabiot made a breakthrough hard to come by. The Blues managed to equalise before the half-time whistle, as Diego Costa turned Thiago Silva inside and out like a baby playing with car keys. Pressure continued to build for the Blues, but the half-time window stunted any momentum they had managed to build. The second half saw an almost immediate change, as Costa begun to feel the niggle of his hamstring and the PSG stars regained a foothold in the game. The removal of Costa, who was a doubt before the game, saw the introduction of Bertrand Traore and a loss of optimism around Stamford Bridge. Cesar Azpilicueta followed the substitution with a rare lapse of concentration as Angel Di Maria found space on the left wing and placed a ball onto the right foot of Zlatan Ibrahimovic to kill off the tie with half an hour to spare. The remainder of the game only saw things get worse for Chelsea. The side quickly lost faith, Eden Hazard was taken off with an injury and not a single chance of note was created. 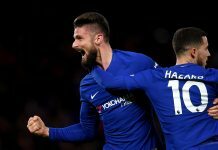 Chelsea must now see a top 6 finish and an FA Cup victory as the only way to make this season even the most minor of successes. Hazard and Costa look likely to be out of the Everton clash this weekend and the season risks ending just as it started.